Throughout the past decade e-reading has become a popular way for people to conduct research, communicate with others and it has taken technology to a new level. An e-reader is a handheld device on which electronic versions of books, newspapers, magazines, and other types of written context can be read. When this originated, it was only throughout of as texts that were posted to the internet. In more recent years this phenomenon has become a trend that companies, like Amazon and Barnes & Nobles, are capitalizing on by creating tablets (kindle and nook) that customers can use specifically for e-reading. 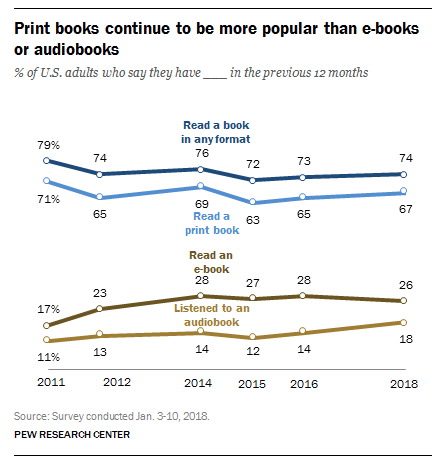 Over the last few years people the amount of people who use e-readers for their books, although people continue to buy paperback books and also get audio versions of books, which aren’t as popular. 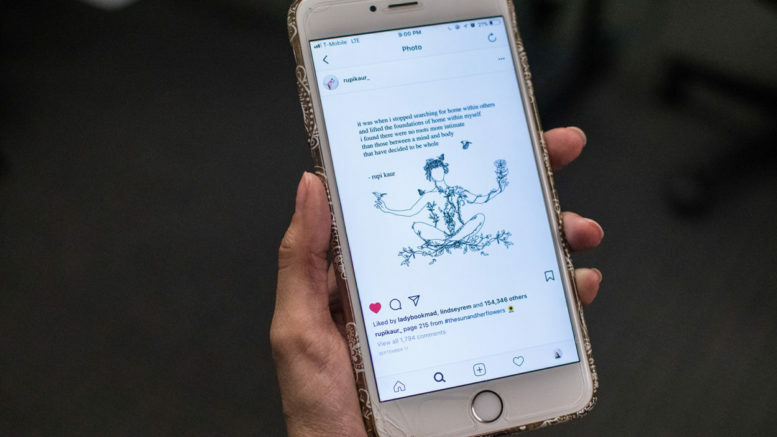 Even I have found myself using my phone to read because of the convenience of not having to carry anything other than my cell phone, since I often just read from the kindle app, and easy access to new books that I may not have found before. Many students have begun using online versions of their textbooks instead of retrieving a physical copy of the book for these same reasons. Having the books on their tablets makes it easier for them to be able to study and look over their class information at anytime, which is helpful for students who work, while going to school and being involved on campus and just dealing with everyday life. Being someone who has always bought physical copies of books for my classes, I always found it interesting when students asked questions about how they were to use their online copies of the required books for classes and wanted to find more information based on this. I found it very interesting that my peers seemed to rely so closely on their technology for their course requirements. Since it makes it more difficult to create citations for work that was done in those classes because many of these books did not have page numbers. I saw firsthand the difficulties that the barrier created for these assignments and class discussions having students not be able to give others an area of reference. Students are now being taught from a young age to use technology as a first resource when doing research so they will be able to find ways to use these sources as they are further adapted. Having noticed this I wanted to see the differences between reading a paperback book and reading an e-book. Print books are more still more popular than e-readers according to recent studies, which was shocking based on the amount of people who used them in class. Based on research that has been done by Åse Kristine Tveit and Anne Mangenab in “A joker in the class: Teenage readers’ attitudes and preferences to reading on different devices” they have found that avid readers tended to prefer print, whereas reluctant readers preferred e-readers and that younger students had positive experiences with e-readers. Growing up I constantly bought books and was always reading multiple books at a time, but it wasn’t until I had gotten a kindle for my birthday that I realized how difficult it would be to do so with an e-reader because when I would go back to a story and felt as though I had lost my place I could go back to the beginning of the chapter with a paperback book, which happens often when I am multitasking and am unable to put all of my focus in the work and complete it in a short amount of time. Yet, e-readers do not give you that option, they are said to be easier to annotate and keep notes on, but there are many people will finish their text sooner when using an e-reader. However when I looked further into the information about e-readers I found out how much worse it is for your eyes. Having heard this before I didn’t believe that it was true until I looked at an interactive website that shows all of the information that explains just how the text on your tablet should be set up to prevent eye strain. This setup made it difficult to read quickly because there are barely any words on the screen based on the line spacing, line size, justification of the text, and margins. By having the screen set up in the way that is suggested each line would have only between two and three words on each line (when using what looks like a smaller screen). This is believed to help people who with poor eyesight and reading disorders, like dyslexia, because of different aspects; such as being able to control amount of words on each line and the space between each letter. In being able to do this the people who suffer from poor eyesight and reading disorders are able to change the way they see the text and have a better understanding of what they are reading within their first time reading the text, rather than having to go back over the same part of the text multiple times. Although I do not suffer from a reading disorder or poor eyesight, however my eyesight has decreased because of how often I was using the Kindle app on my cell phone to read, I continue to read using both paperback and e-readers. Since I have the original Kindle there is no backlight in the tablet, there is not as much of a worry about a strain on the eyes with the tablet I have, however the new models do offer it. I have noticed my kindle gives me books that are written by authors who only publish their work electronically and for readers to experience something that may have never been published had it not been for this technology. Within the next few years the percentage of people who use e-readers rather than reading paperback books is most likely to raise because there are more resources that people can use on e-readers for different things as well as reading. Senior Liberal Studies major who loves Disney, reading and exploring new places.